Each year the Society for Environmental Graphic Design sponsors a contest to recognize the best in environmental graphic design. This year’s Juror’s Award went to Norman Lee and Charles Houser for their Billboard Earthbag Project. The designers say: “Because most conventional sandbags are fabricated from polypropylene, they are very vulnerable to UV rays and quickly begin to deteriorate when exposed to the sun. Consequently, earthbag shelters need to be plastered to maintain their durability during extended use.The Billboard Earthbag Project envisions using billboard vinyl as an alternative material for earthbags. Polyvinylchloride (PVC) or vinyl, a virtually indestructible, UV-resistant material that cannot be incinerated because of the toxic gases it would emit, represents a substantial portion of the PVC in the world’s overburdened landfills. Because of its durability and imperviousness to the sun and other elements, billboard PVC is an ideal material for reuse.The reuse of billboard vinyl in earthbag construction mitigates the impact of global warming in two ways. Transforming this landfill-bound material into another useful product helps lessen landfill overflow worldwide. It also eliminates the need to protect earthbags from UV rays, resulting in more robust emergency shelters that can be used longer to lessen the human suffering caused by natural disasters.As a visual concept, each billboard shelter stands as a symbolic gesture of sustainability. Beyond its environmental benefits, the strategy of reusing billboard vinyl visually recontextualizes the nature of billboards, which are symbols of mass consumerism and a pervasive form of visual pollution in our world. This concept does not seek to generate imagery, but instead appropriates existing commercial imagery as a metaphor for global recycling and reuse. 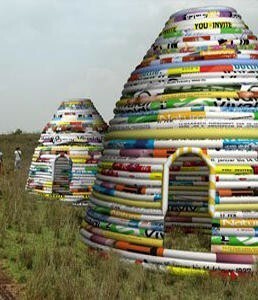 Assembled together into a shelter, the earthbags create a dynamic and vibrant pattern of collaged images and text from around the world, dramatically suggesting a unified, international gesture of sustainability, hope, and humanitarianism.” According to the jurors, they "were intrigued by this project as an example of ‘cradle-to-cradle’ design pertinent to the signage industry. Utilizing intrinsic qualities of billboard PVC—UV resistant and near indestructible this concept proposes the creation of dwellings from recycled material and imagery. The idea takes the recycling of billboards, street banners, and print graphics already employed by art museums in the creation of second-use products—to another level. Truly inventive!" This all sounds pretty good, and might well work if the billboard material were cut and sewn into bags. One obvious disadvantage of the idea is that since PVC is toxic when burned, this would present a potential hazard to the occupants, but of course this is true of many modern building materials. PVC poses a great risk in building fires, as it releases deadly gases long before it ignites, such as hydrogen chloride which turns to hydrochloric acid when inhaled. As it burns it releases yet more toxic dioxins. Additionally, vinyl does outgas highly toxic VOCs over time. Fortunately most of this danger would have passed with the use of recycled signs, but this could also be an issue.